Snapper fishing is a fun, easy, and delicious pastime for the entire family. Even the youngest of children can haul in a snapper and they’re so much fun to catch the grumpiest of old men can’t help but laugh as they fight these feisty fish. Snappers are baby bluefish. In the late summer they feed voraciously and will strike at anything that moves. That makes them easy and fun to catch. Once they’re on the hook they fight like heck, but rarely get away. If you want to introduce someone to the sport of fishing, snapper fishing is the way to go. They're also easy to cook and taste great. Perfect for lunch or dinner. Snapper fishing is fun for the whole family. 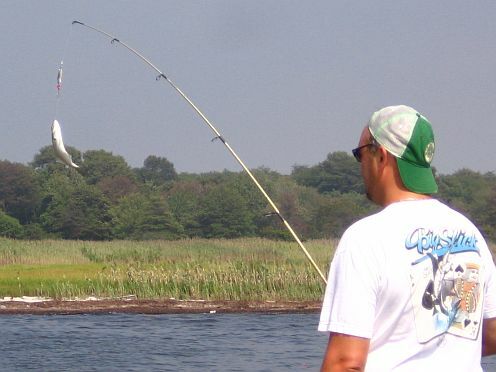 On Long Island snapper fishing starts in August and is full swing by Labor Day or mid September. The fishing is great through most of September and slows down by the beginning of October. Of course all of this varies somewhat year to year, and by location. 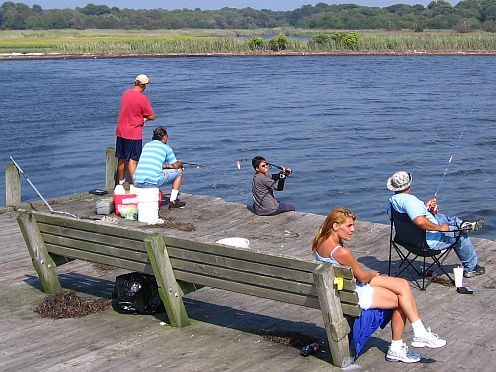 Some parts of Long Island will peak earlier or later, but in general the last 2 weeks of August and the first 2 weeks of September are prime time for snapper fishing. On the Great South Bay snapper fishing is best in the canals and estuaries that flow into the bay from the mainland. On the north shore you’re best bet are sheltered areas like small harbors and marinas. 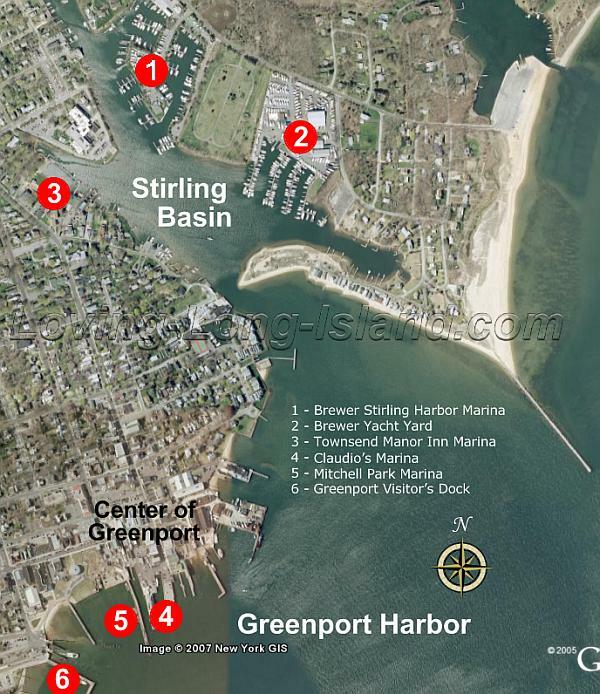 I’ve had great results in Stirling Basin near Greenport Harbor. There are way too many places to fish for me to list here. Your best bet is your local town hall. Ask them for the locations of the fishing docks in your town. Many people don’t like the taste of bluefish and won’t eat snappers. But because snappers are baby bluefish, they don’t have the same fishy taste as the adult blues. The meat is white and finely textured, and is as good as any fish you’ve ever eaten. I highly recommend giving snappers a try. Fish on! A Snapper on the hook. 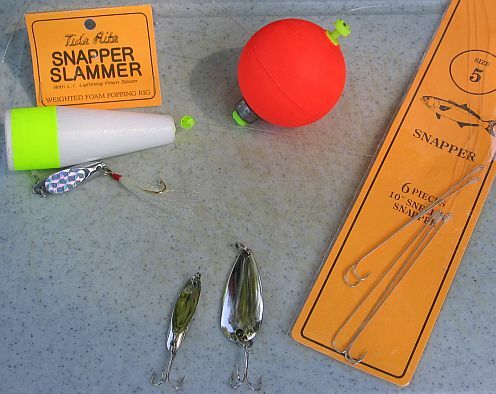 All you need for snapper fishing is an inexpensive fishing pole, some bait, hooks and a popper, a bucket, and some rags. You can use a bamboo pole, but they tend to break easily (use some electrical tape to fix it). My favorite snapper pole is a Shakespeare ultra light action Ugly Stik. It’s a very light rod similar to bamboo in flexibility. When you have a snapper on this pole it will bend like mad, but will not break. Hose it down and let it air dry after each use and it’ll last for years. But anything will do. You can break a stick off a shrub, tie a string and hook to it, and you’ll catch snappers. For bait spearing seems to work the best, but when the snappers are biting, you can catch them on anything. I’ve even used bologna. You can also use a lure without bait. Any of the shiny treble hook lures like Snapper Zappers or Johnson Sprites work well. I’m partial to the Johnson Sprites because I’ve been using them with good results since I was a kid. Snapper Slammer rig, orange popper, snapper hooks and treble hook lures. Long shank hooks make it easy to offer natural looking bait. Put the hook through the spearing’s mouth and out one of the gills, then hook it into the tail. Since snappers attack from the back, they’ll bite right into the hook. In through the mouth, out through the gills, and into the tail. A snapper biting this bait won’t get away. 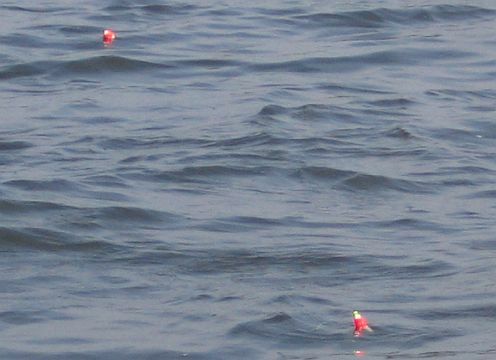 Poppers are used to hold the bait at the right depth, about 18 to 24 inches. It doesn’t matter what kind of poppers you use as long as you can see them (bright colors are best). Cork is the traditional material, but plastic is more popular. The fish don’t care. 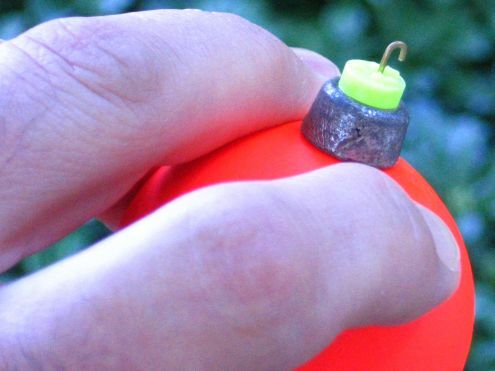 Attach the popper to your fishing line by squeezing between your fingers to expose the spring loaded hook. Release and it will firmly grip the line. You can get everything you need for snapper fishing at your local bait and tackle shop. They’ll help you with poles, hooks, poppers, bait, etc. and show you how to set it all up. If you still need help just ask someone at the fishing dock. Most people are more than happy help out a newcomer to the sport. And remember, this is easy. When the snappers are biting it’s hard to not catch them. Just be patient. Here is a video that I made showing how to catch, fillet and cook snappers. There are 2 snapper fishing techniques you can use. Bait and popper, and cast and reel in. If you’re using bait and a popper make sure the popper is set to hold the bait about 18 to 24 inches below the water’s surface. Cast your line out a little way out from the dock and wait. Some people will try to cast as far as possible. This is not necessary. Just get it out there a reasonable distance. Bamboo poles have just a short length of line on them, so just plop it into the water as far as it will go. Once your line is in the water all you have to do is wait and watch. When you see the popper dip below the water you know something is biting. If it goes under and stays under, or starts swimming away, you’ve got a fish on your hook. You’ll know for sure when you’ve caught a snapper because it’ll feel like something is trying to pull the pole out of your hands. When you see your popper go under and swim away, you've got one! 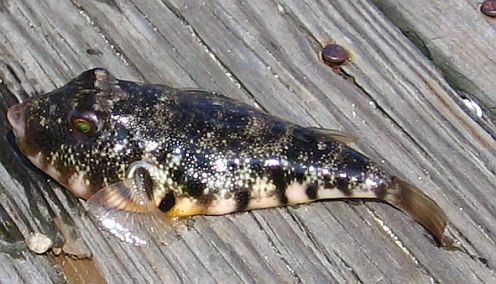 The second technique for catching snappers is to use a lure without bait. In this case you will cast out as far as you can and slowly reel in your line. The lure will tumble and flash and draw the attention of all snappers within sight. They can’t resist a chase so they’ll attack that lure with fury. As you cast and reel try different speeds to see what works the best. Faster will keep the lure near the surface, slower will let it sink a little. Try to keep the lure about 2 feet under the surface. Too deep will mean fewer snappers, and the possibility of catching other kinds of fish like eels, sea robins or blowfish. A baby blowfish caught while snapper fishing. Use new bait. If your bait is real old it may not work quite as well and you’ll be the only guy on the dock not catching any fish. Spearing comes frozen in 1 pound bags. Keep it on ice so it stays fresh. When you’re done for the day, bring it home and freeze it for next time. 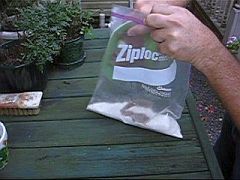 Handling your bait like this will assure freshness, and you won’t have to spend any money for bait next time. Don’t worry if you’re not good at casting. You don’t have to cast very far from the pier to catch snappers. In fact, you can just drop you line in the water right at the dock and you’ll do just fine. If you want to get good at casting the best place to practice is your own backyard, or in a park. Anyplace you can avoid hitting someone will work. Fish the incoming tide. Snappers seem to be most active at high tide, so start fishing at least 3 hours before. Use this list of Long Island tide tables to find out when high tide is in your area. Be patient. During a good run you’ll catch snappers like crazy, but in between there’s nothing you can do but fish and wait. The day's catch. The current limit is 10 per person, so this just about does it. Snapper fishing on Long Island is not only a great sport, but it yields a tasty reward as well. Snappers are a good eating fish. The meat is white, finely textured and delicious. Snappers are cleaned like you would clean most fish. 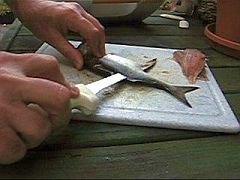 Start by cutting off the fins with an old scissor. Then scale the fish. You can use a descaling tool, but I find a knife scrapes them off just as well. Hold the snapper by the tail and scrape against the grain. If you plan on removing the skin then you can skip the fin removal and descaling step. Once the scales are gone just gut the fish and remove the head. You can cook them just like this and eat around the bones, but it’s probably better to fillet the fish and remove all bones before cooking. 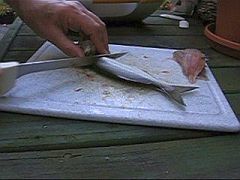 To fillet a snapper make a cute near the gills and run your knife along the backbone towards the tale. Try to leave as little meat as possible on the skeleton, but don’t make yourself crazy. Remaining bones can be removed before cooking. Also be sure to cut away the rib cage from each fillet. Snappers are good on the grill or floured and fried. 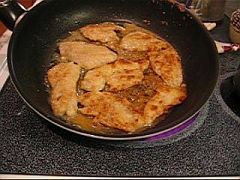 I throw some flour, salt and pepper in a zip bag with the snapper fillets and shake it until the fillets are coated. In the frying pan they go until golden brown. Be careful not to over cook or they’ll get dry. So there you have it, snapper fishing on Long Island: Fun, tasty, and a great way to end the summer. Like to fish? Have a story to tell? Make your story at least 300 words (more is better). If you have pictures great, we'd love to see them. Post shorter stories in the comments section at the bottom of this page. Snapper Fishing, Westhampton Beach, Circa 1950 (or so).